The decision to begin hospice care is yours and your family’s alone. JourneyCare will be with you every step of the way. Hospice is a specialized, compassionate approach to caring for those with serious illness who may have weeks or months, rather than years, to live. The focus is on caring for the whole person, with expert pain and symptom management and emotional and spiritual support, to improve quality of life. When your illness is progressing despite aggressive treatments, and you and your family want to focus on comfort and quality of life, rather than curing your disease, and it may be time to talk about hospice. Care is provided in your home, wherever you call home, by a dedicated and specially trained interdisciplinary team of professionals, who work closely with your physicians. 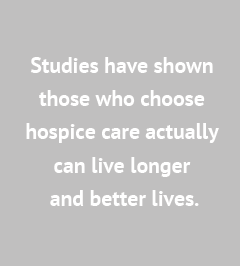 Studies have shown those who choose hospice care can live longer and better lives. With enhanced quality of life you can live more fully and in comfort, without pain. We start with you, not the disease, understanding and honoring your unique needs, values and wishes. Your Care Team will help you and your loved ones focus on what matters most to you, navigating the physical, spiritual, social and emotional issues surrounding serious illness, with a plan of care tailored to your wishes and goals. Visits from your Care Team are scheduled at times that are convenient for you and your family, and you have access to support 24 hours a day, 7 days a week. Just call us. JourneyCare realizes that serious illness affects the entire family. That’s why patient and family centered care is at the heart of what we do. We provide the education and resources family members and caregivers need to confidently care for a loved one, along with emotional and spiritual support, as we accompany you on your journey. Research shows that hospice care works best and is most beneficial to you and your family when used to improve quality of life. Many patients and families have told us they wish they had called JourneyCare sooner. By choosing hospice care early rather than later, JourneyCare can help you make each day the best it can be, however you define that, with expert pain and symptom management, support and empowerment for your family. Routine Care is provided in the comfort of your home, wherever you call home. This is the most common level of hospice care. Members of your care team will make regular visits to provide care and support to you and your family, which includes treatments, medications, durable medical equipment and supplies related to your hospice diagnosis. 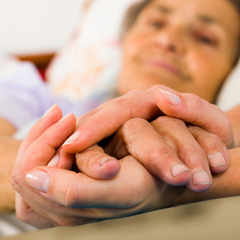 Inpatient Hospice Care is provided when pain and symptoms become difficult to manage at home. JourneyCare’s five Hospice CareCenters, located in Arlington Heights, Barrington, Chicago, Glenview and Woodstock, provide around the clock medical care. Once symptoms are under control, the patient can return home. Crisis Care provides intensive care in the home setting for brief periods, when a patient requires skilled nursing care to manage difficult pain and symptoms. Respite Care provides temporary, short-term care for patients to relieve their family member who is the primary caregiver. Hospice care is provided by a dedicated and specially trained interdisciplinary team of professionals, who work closely with you, your family and your personal physicians to develop a plan of care tailored to support your unique needs, goals and wishes. Board-Certified Hospice and Palliative Care Physicians who will work with you and your primary care physicians to develop your plan of care. Registered Nurses who will meet with you and your family on a regular basis to assess support needs, and coordinate communication with members of the care team. Certified Nursing Assistants who provide hands on, personal care and help with activities of daily living. Social Workers who provide you with a range of support services, including counseling and emotional support, education and help accessing community resources. Chaplains to help you and your family cope with the illness through spiritual support, emotional support and life review. Volunteers who are specially trained to provide assistance and support for you and your family. They can provide companionship, run errands, provide light housekeeping, go grocery shopping or help with hobbies or crafts.